MUM if you happen to be reading this then please look away now!! Silly me, I've made my Mum's birthday card for this week's sketch and of course it's a week early, oops! She doesn't normally look at my blog so fingers crossed she won't this week either but D'oh, how silly of me!! As I said above I've made my Mum's birthday card for this week's challenge. My mum is into line dancing in quite a big way. She doesn't just go along to dance, she actually teaches an advanced class to between 30 and 50 ladies every week - twice a week! She only does this in the winter while she's away living it large in Florida and she's actually just got home so won't be doing it for a little while so no doubt she's missing it already! I therefore scouted the internet looking for a line dancing image and this lovely lady is what I found. She's by Mayzy Art who I've only just discovered and they have some absolutely fabulous images. I used denim coloured papers where I could (My Mind's Eye Collectable), and added buttons, twine and natural trim to give the card a bit of a rustic effect. I printed the sentiment on my pc. Overall I'm thrilled with the result, hopefully mum will appreciate all the effort too! 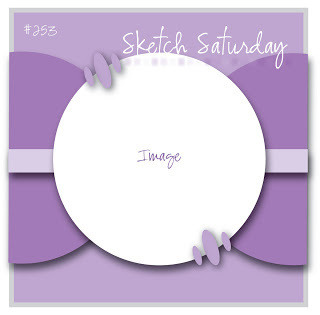 This week's Sketch Saturday challenge is sponsored by That Craft Place and they have a great prize for this week's winner so pop on over and join in the fun! Such a fun card! Love that image cute!